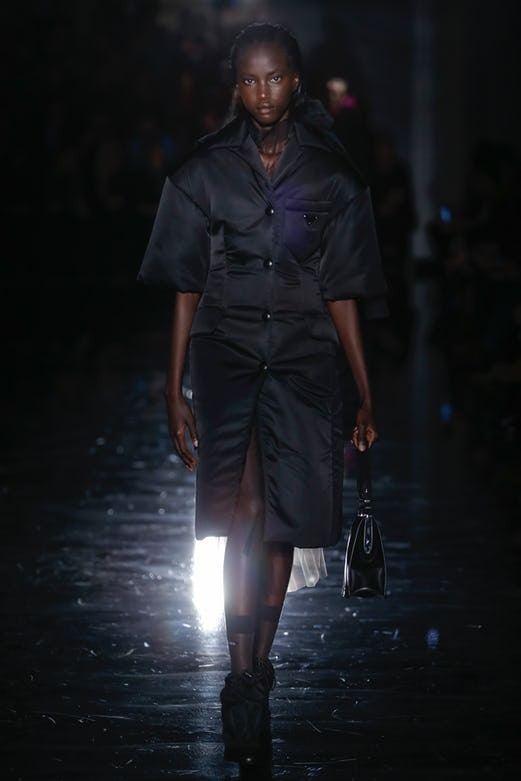 Miuccia Prada showed a collection founded on oppositions, extreme power and extreme femininity — where sweetness read as a disguise, a distraction and a dare. MILAN, Italy — The exhibition that currently takes up most of the space at the Fondazione Prada covers the years when Mussolini was in power in Italy. It has an aching timeliness with its detailing of the impact that an autocratic popinjay can have on popular culture. “My thoughts are influencing the Fondazione,” Miuccia Prada declared after her show on Thursday night. It made sense to assume some connection between what she is showing in her galleries, and what she showed on her catwalk. Maybe this collection was her contribution to facilitation. There was a lot of sweet prom dress girliness balanced on ankle socks and heels — there was even a manga flapper, sheathed in electric filaments — but it was matched to bulky tweeds and sporty nylons, hyper-protective. There was even a variation of the sanitation worker that Raf Simons offered at Calvin Klein. Defensive, vaguely apocalyptic. In that context, the sweetness, in embroidered tulle veils, read as a disguise, a distraction, a dare. You hardly needed Bill Murray and Wes Anderson in the front row to underline the depth of irony in such a notion. And the discombobulating layering of Frederic Sanchez’s soundtrack — Blondie, Bryan Ferry, Tom Waits — only added to the dislocated mood. The show took place in the top floors of a recently completed tower in the Fondazione Prada compound. In the arid industrial space below were mounted neons of Prada iconography: The bananas! The monkey! It’s the art of Prada to make you feel on the edge of something. She did it again.